Eighteenth-Century Ireland/Iris an Dá Chultúr, special issue no. 1, 2011, 290 pp. 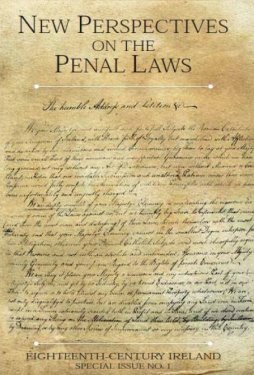 This collection of articles presents a variety of new perspectives on the penal laws, a subject that continues to attract much public interest and engagement ... many of the articles either use new sources or offer fresh approaches to sources used before, or let us see Ireland through the lens of other countries. This publication can be ordered from the Eighteenth-Century Ireland Society.